Asthma is a chronic disease of the lungs that represents as inflammation of the airways. This condition narrows the airways and causes recurring wheezing periods, shortness of breath, coughing and chest tightness. In most cases, the coughing is experienced early in the morning or at night. Asthma is a chronic disease? This condition can affect people of all ages, but it is most commonly diagnosed in children. At this moment, more than 25 million people are diagnosed with asthma in the United Stated, out of which 7 million are children. If you wish to understand what is asthma, you must first understand the functioning of the airways. These are tubes whose purpose is to carry the air in and out of the lungs of the human and when they are inflamed, this makes the airway swollen and extremely sensitive to everything that surrounds it, particularly to certain substances being inhaled. When a reaction appears in the airways, the muscles that surround these are beginning to tighten, which results in narrowing of the airways. This in term reduces the amount of air that flows into the lungs. As the swelling worsens, the airways become narrower and the cells make more mucus. This sticky liquid can do even more harm to the airways by narrowing them even more. Sometimes the symptoms of this condition are mild and stop after a little while, while in some cases the patient requires minimal medicine treatment. In some more severe cases, the symptoms become worse and worse. When this is happening, a patient is suffering from an asthma attack or an exacerbation. In some cases, the attacks can even be fatal. Asthma is actually estimated to be the cause of 3500 to 5000 deaths every year in the United States. The estimated cost spent by the US economy on treating this condition is $19 billion. Speaking of worldwide statistics, this condition affects 300 million people, out of which about 75% suffer from allergies at the same time. When an asthma attack occurs, the walls of the bronchi and their muscle tissue start going into spasm. When this happens, the cells start swelling and secreting mucus, which causes the bronchi to narrow more. Mast cells are the cells in the bronchial walls that release the substances, which cause asthma attack. These include histamine and other chemicals commonly referred to as leukotrienes which absorb the blood cells and cause the inflammation. In addition, many asthma patients react to foreign substances including dust mites, pollen and animal dander. At this particular moment, about 9 million children are diagnosed with this condition in the United States, out of which approximately 20% begin while the children are very young. Asthma begins in childhood but children with genetic predispositions of becoming sensitized to allergens are more at risk of developing it. When these children become more exposed to the allergens like dust mites, fungi and animal proteins, they start producing an antibody with the purpose of fighting this materials. This is when the cells in the airway become more sensitive and an asthmatic response results of it. When it comes to adults, the most common trigger for asthma is allergies. Adults can be exposed to these materials at work or simply be sensitive to some drugs like aspirin and NSAIDs like ibuprofen. When being exposed to forms of solvents, wood dust and even plastic, people are more likely to get asthmatic. 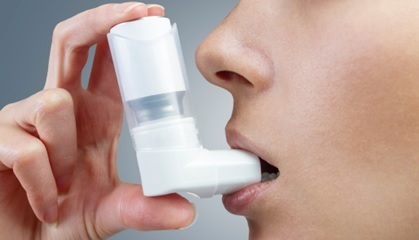 Research shows that women are more commonly diagnosed with adult-onset asthma. When compared to child-onset asthma, this type of asthma is more continuous. People may not have allergies but they can still develop asthma with exercising. Such asthma episodes can last for a few minutes and are developed in the form of breath gasping. Breathing in cold air and even aerobic exercises that last for more than 10 minutes can induce an attack in patients at risk. Additionally, polluted air and chemicals that are found in playing fields or exercising fields are also more likely to increase the risk of asthma attacks in some people. When it comes to diagnosing asthma in young children, physicians face many challenges. There are many features that are consistent with this condition, but are also found as symptoms of other diseases. In addition, there is no such thing as an asthma test, so the only way to diagnose a child is by ruling out other diseases. When a child starts coughing and wheezing, the doctors must check for asthma. Diagnosing a child with asthma is more of a general approach that requires collaboration between the doctor and the family of the patient, while working on ruling out other conditions and diseases. Asthma is commonly mistaken with reactive airway disease. These two are not synonymous but include differential diagnosis out of which asthma is the most common one. When a child is very young and suffers from respiratory symptoms, this first requires clinical features description. The doctor diagnosing this child must think of all possible causes for the symptoms and consider all the possibilities prior to making a judgment. If a child has difficulties breathing and one assumes that it has asthma without ruling out other diseases, they are risking missing fibrosis, tuberculosis, foreign body aspiration and many other conditions that cause the same symptoms. Asthma is a chronic disease that needs to be handled carefully. This is a primarily a wheezing disease, so that should be your first indicator to visit the doctor’s office. Differentiating the coughing and wheezing is an important task of every doctor. Additionally, when it comes to children, one has to check what exacerbates the symptoms of asthma. Generally speaking, people who suffer from asthma can take an active role in the treatment and management process of this condition. If you wish to have a good thorough treatment, you must take this condition seriously and build a partnership with the health care providers. Taking care of your asthma early at its peak or as soon as the symptoms start occurring is the only way to avoid asthma attacks. What you must realize is that asthma is a dangerous disease that can lead to many complications, sometimes even to death.